Main Street in the Springs! The latest issue of Spree Magazine - March 2007 is out. Quickly noticed über good-guy Barry Muskat's article - An Architect's Loft - about the loft conversion at 1718 Main Street [google map]. This morning I snapped this exterior pic. And a quick check of City records seems to indicate that current owners purchased this building for 50K at the City's tax sale back in 2001. Way cool. Thought I knew what was happening in my neighborhood. I totally missed this. Thanks Barry! You'll never believe what you see out the front windows of this loft. One of Main Street's coolest single family homes - here and here - right across the street! Just around the corner, let's hope that the Savarino people will get this issue fixed, in front of Artspace, yikes! Last week while reading Richard Florida's blog - The Creativity Exchange - I noticed this post, Best and Worst Regions for Children based on a recent Harvard School of Public Health study. I linked to it here - Children Left Behind and provided links to the full set of data used in compiling the report. The lead front page story in yesterday's Buffalo News - Long Odds for Urban Children - focuses on the Harvard study's findings. Kudos to Deidre, even if the local blogosphere first picked up the story here in Buffalo, NY. Quick LexisNexis check reveals that The Washington Post is the only other newspaper that ran the story - here, on January 30th. They included links to the data set at diversitydata. Commenters in that story site a different set of factors than Deidre sites in her story that place black and hispanic children at the bottom of the pile here in Buffalo when compared to children in 100 other metro areas. The administration of Mayor Byron W. Brown did not respond to requests to comment on the study's findings. Byron still hasn't returned my email either. Been interested in the relationship between the on-line world of blogs and wikis and the world beyond since I started blogging. To what extent can the opinions and views expressed and shared on-line help in changing and shaping the world beyond our lap-tops and desks? Questions like this beg larger issues. For example, what is a community? Can individuals leverage the technology at our finger-tips and effect meaningful social change? Can we organize in such a way to make a change in the world we inhabit? Encourage anyone interested in the intersection of this technology and social change to read Mark's short essay and uncover some of the creative thinking happening around the web. Check out what just happened in Toronto...way cool! Some planned activities 100 miles away - right here! The view from my office window, looking south down Michigan Avenue includes this house at 1466 Michigan [map - proximity]. Despite the obvious issues - windows, porch and siding - this two family house got a new roof five years ago and is structurally in great shape. I know it's ugly, needs tons of cosmetic work and new plumbing and electric. It's just around the corner from the new 30m renovation of the Performing Arts HS. The City owns the two lots next door, so you could probably piece together a rather unique homestead. Interested? Let me know. The alternative - 12-15K in tax payer sponsored demolition. I've been following the plight of 125 Woodlawn Avenue. Since a local contractor who lived here and left for Charlotte, the place has been on a down hill slide. The City took possession last October in a tax foreclosure proceeding. It was demolished this week. Price for this demolition, $20,000. 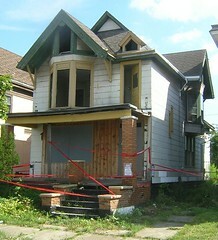 I first wrote about 125 Woodlawn in August 2006 - High Price of Red Tape. 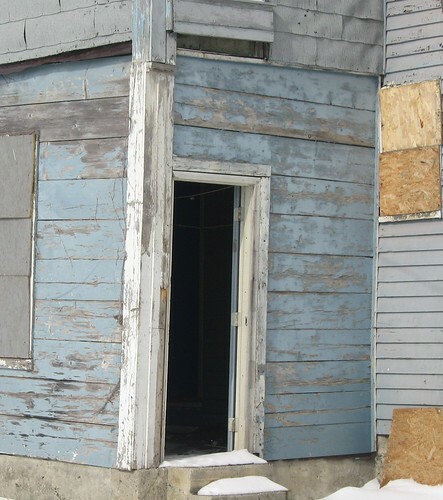 I learned from looking through the documents stapled to the front door that the City was paying a local contractor $8,000 to remove the asbestos siding. 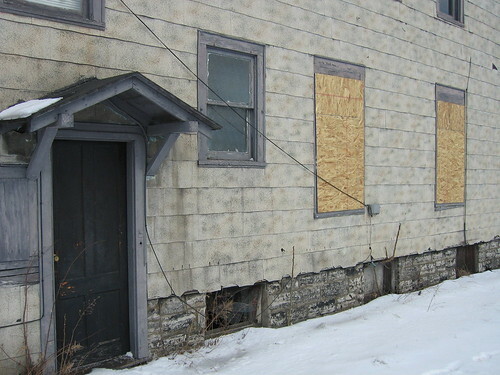 In Red Tape - Part II, from December 2006, shows what the house looks like without the asbestos siding. Asbestos siding is an amazing product. It holds paint very well and seems to require very little maintenance. Structurally this house was in very good shape, with the exception of some support issues on the front porch. Let me ask again. 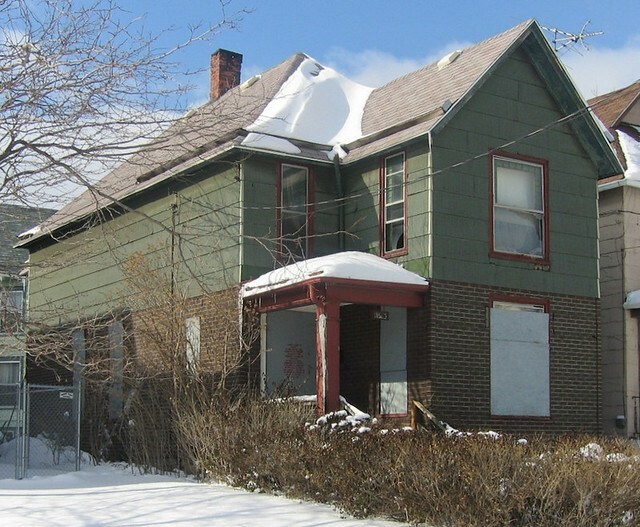 Why are we spending so much on demolition when the same 20K could have been used in a revolving loan fund to help with the rehab here at 125 Woodlawn. 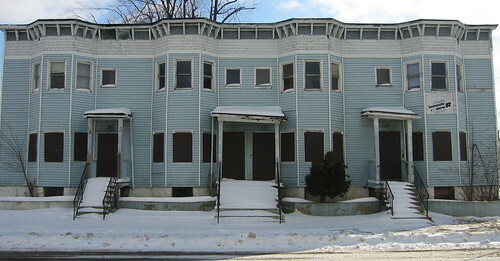 This sort of stick style house appears all around the Cold Spring neighborhood. We need a few people with vision. When I moved to this neighborhood, on this block with 125 Woodlawn, there were 18 houses 10 years ago. That's down from the original 25 shown in this picture from 1956. Today are 13 houses. Five are occupied. Saturday's tour of the Artspace Backyard neighborhood included nine people who came out to explore the architecture and opportunity in this part of the City's near East side. After the regular tour which included a close look at 1042 Ellicott - a City owned single family home, we gathered at the Sonic Café and ventured further East and visited two of my favorite catholic complexes! This afternoon I had the opportunity to poke my head inside 1042 Ellicott [see map] for the first time. The City of Buffalo has owned 1042 since October 2006. Frequent fixBuffalo readers will quickly see that 1042 is located right around the corner from Artspace! The place is filled with a former owners stuff as you'll see from the pics. Very cool literary finds in the house as you'll see in the slide show. The house is unusually narrow, probably 20' wide and has three and possibly a fourth bedroom or upstairs office. We quickly realized that the roof was newer, the windows - about 90% intact and the foundation appeared to be solid. What's needed initially - clean out, new plumbing and electric and lots of cosmetic work on the inside. Depending on your budget, the icky siding could wait for phase two or three of your homesteading plans. Past experience suggests that the clapboard underneath is very well preserved. I can help you negotiate the City Hall maze if you're interested in living next to Artspace. 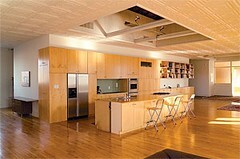 Join me for the Artspace Backyard neighborhood tour Saturdays at 11am and take a closer look at this gem. Earlier this week I posted about the Hamilton Ward House and asked readers to call Belmont Shelter and ask them, as the owners of Ward House to re-secure the property. Well, two days later, I returned and saw that it was secure. Thank you Liz! While the Ward House is once again secure, a number of neighbors pointed out that Belmont Shelter has not once shoveled the side walks in front of four parcels they own on Coe Place. 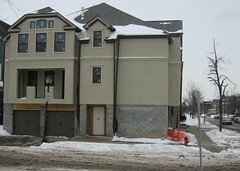 Pictured below are the vacant lots at 17, 23 and 29 Coe Place. 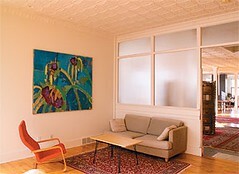 Saturday at 11am - Artspace Backyard Neighborhood Tour - details. Join a few of afterwards - here. We'll be leaving from the Sonic Café at 1230 - make sure to bring a flashlite and your camera! Anyone who has visited Chicago's Loop has probably seen the famous Picasso sculpture in Daley plaza. But when it was unveiled on August 15, 1967, it was compared to everything from a dodo bird to a giant cheese slicer. 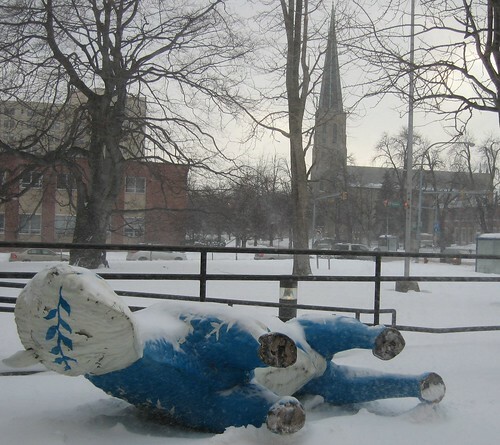 Kim Babon has been studying this and other controversies surrounding public art. Kim has spent nine years researching the public art debates, trying to determine why some pieces hit a nerve when others don't. Kim is a doctoral candidate in the University of Chicago's sociology department. Also with us is Faye Nelson who is leading the development of Detroit's riverfront. Faye is President and CEO of the Detroit Riverfront Conservancy. Prior to her appointment, she was Vice President, Governmental Affairs for Wayne State University, where she led the development of the Wayne State University research and technology park. It's an indication that the outside world's perception of Buffalo is changing. 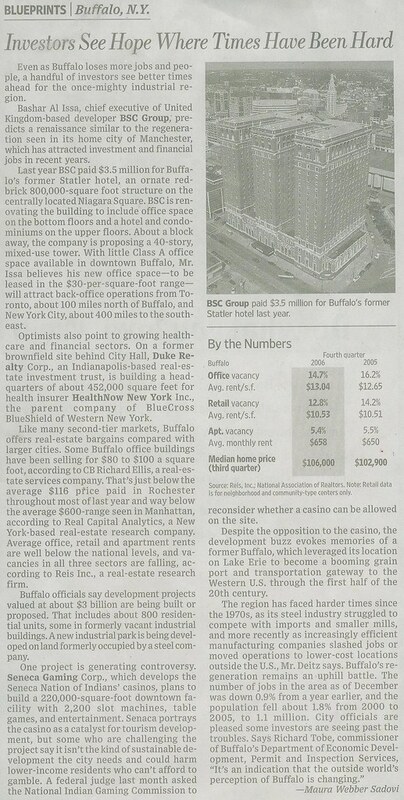 Last time Buffalo, NY made the Wall Street Journal - September 1, 2006...an East Side Business! 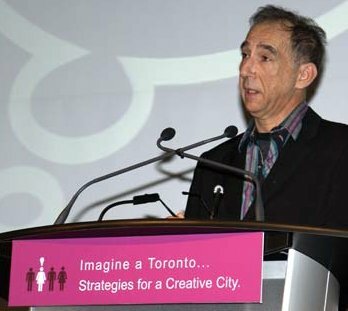 This is from one of Pier Giorgio Di Cicco's addresses - Toronto's Love Affair with Creativity - available at the link below. Alliances are negotiated. Being in love with a town means that you don't have time to negotiate. When you are in love, you don't negotiate; you don't put up buildings that don't speak to other buildings; you don't break the town up into communities each with its own loyalties. We have to come together, with a common ideal and a common enthusiasm. Creativity is the language of ideals and enthusiasm. If Toronto wants to cohere it has to go all the way with what the creative craze suggests. Commerce and culture must be seen as one. Perhaps we should advertise publicly, again and again, with funded dollars, that "Creativity Means Business"; we must hear that again and again until we live by it. Otherwise we will retain our silos and happy ghettos of diversity with their local nationalisms, with no common zeitgeist. The city, both in the metropolis and the “sprawl” must share one ethic of creativity. Read more about Pier Giorgio Di Cicco. Couple dozen addresses and lectures regarding the nexus of creativity and urban issues. Less than 100 miles from City Hall to City Hall. One of my favorite pix, so close and yet so far away. Ok, ok...it's just that Wednesday is the 100th anniversary of the birth of one of my favorite poets, W. H. Auden...same guy who wrote September 1, 1939. Yes, I sometimes think about things besides blighted buildings. Last year - Spring and Summer 2006 - Friends of Coe Place, a loose knit group that coalesced around saving the Hamilton Ward House from the wrecking ball. Belmont Shelter purchased the property at the City tax auction in October of 2005. Took Belmont along time - lots of nudging and some public shamming - to finally board and secure the place. Read about it here - Still Saving Coe Place. While attending a party on Coe Place the other night, heard from a few concerned neighbors that the Hamilton Ward House is once again wide open. Just had to take a closer look. These pix are from Saturday's Artspace Backyard Tour. By the looks of the snow against the board and knowing what the weather has been like for the past few weeks...let's just say it's been like this for awhile. Seems rather odd that the City's premier low-income housing agency - they also build most of the vinyl crap in the City - allows this to happen. I mean the parking lot buts up to to back of the Ward House. 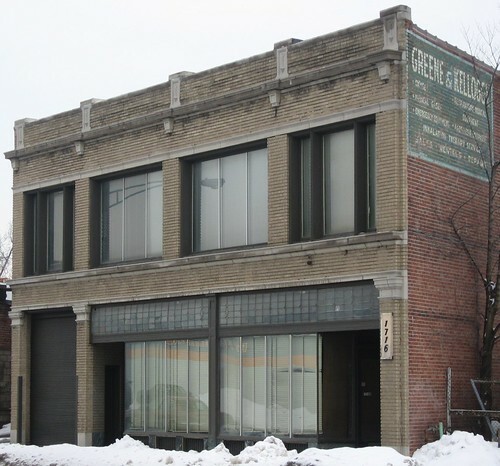 Belmont Shelter is also the property manager for the new Artspace complex, right next door. Let's hope that their stewardship of the historically significant Hamilton Ward House is not a harbinger of things to come. I mean we don't want to start re-posting the home addresses and phone numbers of Belmont's board members. Or, should we? I'll give it a week and see if things get boarded. Meanwhile you can leave a message with Belmont Shelter - 884-7791 and ask them to properly secure the Hamilton Ward House. update 1:15am...just heard from a fixBuffalo reader that part of Saturday's Artspace Backyard Tour should include some activism. If the boards are still off, we'll nail the place shut...join me at the Sonic Café at 11am - details here. Daily reading includes the Creativity Exchange, inspired by the work of Richard Florida. Yesterday I saw this - Best and Worst Regions for Children. Lot's of people talk about how important it is for regions to be good places for families and children. But few, if any, studies have provided detailed empirical evidence to compare cities and regions. A new study by the Harvard School of Public Health and the Center for Health Advancement has developed detailed rankings for the largest 100 metropolitan regions based upon measures of housing, neighborhood conditions, residential integration, education and health. Buffalo-Niagara Falls, NY; Chicago, IL; Cleveland-Lorain-Elyria, OH; Fresno, CA; Jersey City, NJ; Louisville, KY; Miami, FL; Milwaukee-Waukesha, WI; Mobile, AL; New Orleans, LA; New York, NY; Rochester, NY. Bakersfield, CA; Buffalo-Niagara Falls, NY; El Paso, TX; Fresno, CA; Hartford, CT; Los Angeles-Long Beach, CA; Milwaukee-Waukesha, WI; New York, NY; Providence-Fall River-Warwick, RI-MA; Rochester, NY; Springfield, MA; Syracuse, NY. The numbers are certainly atrocious. For what it's worth, Buffalo-Niagara Falls isn't actually in "last place" - it just comes first alphabetically in the group of a dozen or so metro areas that were at the bottom of the rankings in economic opportunity for black kids, and likewise for Hispanic kids. I emailed Byron this morning...still no word. Small houses fascinate me. 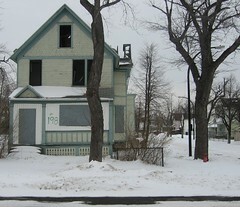 Roger's Red House on Bryant is inspiring and while checking out this new Buffalo Blog - I noticed this post. 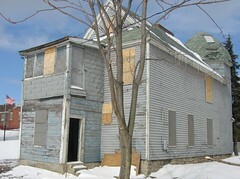 The house on the left at 1107 Gilman Avenue, San Francisco - on the right 269 Fox Street, right here in Buffalo, NY. I've pretty much determined that it's the smallest house in Buffalo - based on frontage - and is being readied for the land-fill. 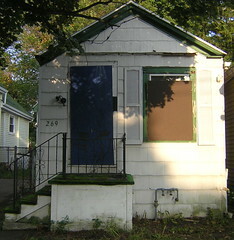 Wrote about 269 Fox Street last September - Smallest House? It's owned by the City and we'll be spending 10-12K for the demolition. 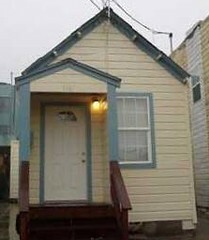 Meanwhile, 1107 Gilman...$469,000...yikes! 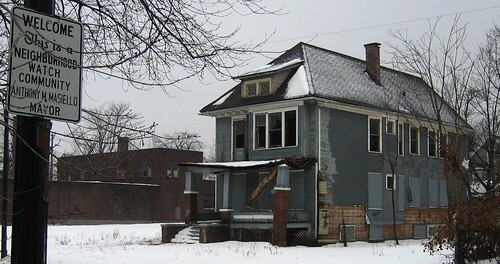 If and when we get serious about housing issues here in Buffalo, NY perhaps we'll do something about stuff like this. 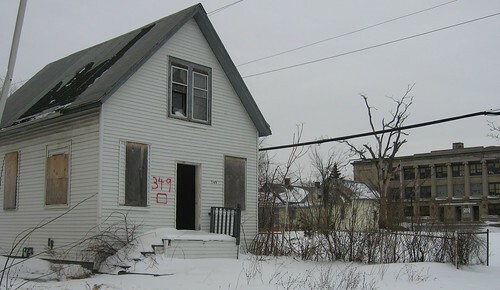 349 Masten has been owned by the City of Buffalo since October 2005. Long time. The front door has been open for weeks. 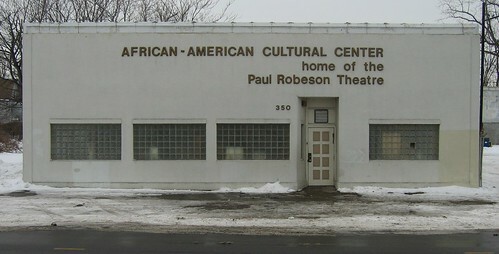 It sits directly across the street from the Paul Robeson Theater and African American Cultural Center at 350 Masten Avenue. You still have a chance to see Mule Bone at the Paul Robeson Theatre. Here's the review from The Buffalo Criterion. Only theater in Buffalo with an abandoned and vacant City owned house directly across the street. Oh...that's Follow-Thru School across the street. Frequent fixBuffalo readers have been following my mini series - Tale of Two Cities - June 4, 2005 • July 27, 2005 • February 2, 2006 • February 13, 2006 • October 11, 2006 - where I've been keeping track of developments at 198 Glenwood and 60 Brantford and comparing how burn-outs are handled in the Elmwood Village and the City's East side. Took these two photos on Saturday afternoon. 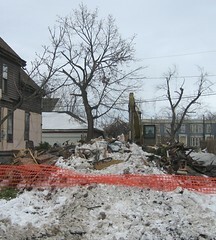 Remember the fire at 198 Glenwood occurred more than five years ago and the property is owned by the City of Buffalo. Elmwood denizens will recall that 60 Brantford partially burned on Friday May 13, 2005 and was promptly demolished and is being developed by Johnson & Sons. Here's the - map - showing the proximity of both properties to Buffalo Public schools. Had a sit down with Andrew Commers last week. He's the project manager for Artspace. 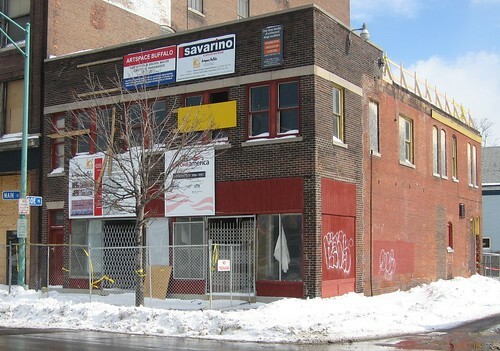 He filled me in on the organization's track record and history in Minneapolis and shared with me that June 1st is the expected opening date for Artspace here in Buffalo. Joining us was Drew Kelly, the guy behind Friends of the Arts Academy, the newly formed organization that incorporates the former Performing Arts HS alumni organization and PTO. We spoke at length about linkages between these two near East side developments and explored some of the collaborative work that Artspace has helped facilitate in other locations. Drew and I look forward to our next meeting with Andrew in a few weeks. Oh...Andrew wanted me to share with local entrepreneurs that the building here at 1217 Main Street owned by Artspace is wide open for development. He'd like to explore any business that might be compatible with this emerging arts neighborhood. Never know when you'll spot a photo-op. I carry my Canon PowerShot everywhere. Was leaving the JCC the other day and noticed that our patron mammal had succumbed to the winter weather. Just finished watching this. I know - hope is not a plan. It's a mantra I've been reciting for the longest time. I repeat it daily. Chris Byrd's video from BroadwayFillmoreAlive. He photo documented the abandonment and vacancy on Person Street [google map]. Here's Chris's post. I compiled a complete list of who owns what on Person Street. There are 97 parcels. 29 houses that look, well...you decide. A recent post about Shrinking Cities with links and suggestions about what to do. And have you heard what Mayor Jay Williams in doing in Youngstown, OH with the exact same set of problems - listen in. Situation is getting worse by the week. Really. Regular reader sent this in the other day. Really cool map of what this neighborhood looked like once upon a time. Compare that view with this - from 1956. Of course the killer view is this one...from today. Like what happened? Didn't take long, did it? In both essays Kotkin drives a wedge between what we think is happening and what's really happening on the street and in the neighborhoods. I see what Kotkin sees on a regular basis. Walking Ferry Street or Utica from Elmwood across Main Street sharpens the senses and provides a glimpse into Kotkin's analysis. Leaving the more prosperous West side and walking East always leaves me with a sense that we're forgetting half the City. That said, I'm hopeful and looking forward to meeting up with Artspace folks on Thursday to begin the discussion of possible linkages between Artspace and Performing Arts HS, a few blocks away. As a board member of the recently formed Friends of the Arts Academy and neighbor, I really want this to happen, bad. Richard Florida over at the Creativity Exchange has his spin on Kotkin's latest, right here - Same Old, Same Old. Last month I teamed up with Marc Odien from WNYmedia and took a closer look at Rev. 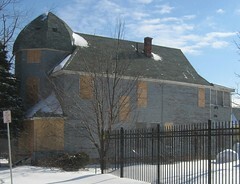 Stenhouse's blighted collection of houses that ring the new home of Performing Arts HS. Rev. Stenhouse does a few things. He's Executive Director of Bethel CDC - owner of the houses featured in last months postings - and also fills the position as Secretary/Treasurer of the Buffalo Fiscal Stability Authority, aka Buffalo's Control Board. Well at some point last week the houses were secured. So a big thank you goes out to Rev. Stenhouse for getting this job done. 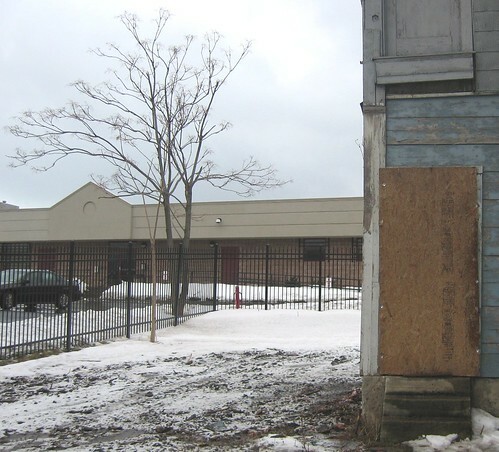 Aside from the City of Buffalo, Bethel CDC is the largest owner of blighted and boarded houses that students attending the 30m renovation of Performing Arts HS in the Fall will have to look at. Imagine looking out your classroom window at this...yuk! Will be keeping tabs on just how secure these places remain. Kind of makes you wonder - Who's controlling the controllers? Youngstown, OH is a shrinking city. So is Buffalo, NY. 36 year Mayor Jay Williams, discusses what this means for Youngstown, OH. He was a guest on Smart City over the weekend. Don't remember hearing an elected City official talking like this, on the record, ever! Always amazed with the Artspace Backyard neighborhood. Saturday was perfect for photos as we stopped at Literacy Volunteers to warm up from the cold and talk about the neighborhood. Some of the houses and sights you'll see include. Tours every Saturday of the Artspace Backyard neighborhood, we leave the Sonic Café at 11am! Lasts about an hour, longer if we get talking and decide on brick oven pizza!...Click for details. Still ahead of schedule and according to school officials most of the work will be substantially completed by July 1, 2007.
a view from my roof! Make sure to check out the location of the new Tennis Courts! Love it! The Creativity Exchange is a daily read. Yesterday, Richard Florida included a post about Jane Jacob's Legacy. I've placed a link to Richard Florida's blog in my post template and expect to feature some of his posts and work couple times a week. We work hard...we should also work smart. 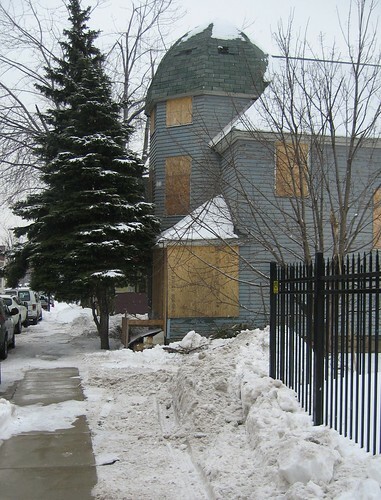 While local preservationists continue to morn the loss of the Atwater House on Elmwood, the Woodlawn Row Houses - owned by the City - were given "local landmark" status by the Preservation Board in 1986. They sit diagonally across the street from the new home of Performing Arts HS. The demolition by neglect of this property is preventable as they sit within 50m of recent public investment in the arts and education. Sort of boggles my mind. Do we live in one City or two? Despite my best efforts to find an owner, keep the lawn mowed in the summer and the property boarded - the Woodlawn Row Houses continue to rot. 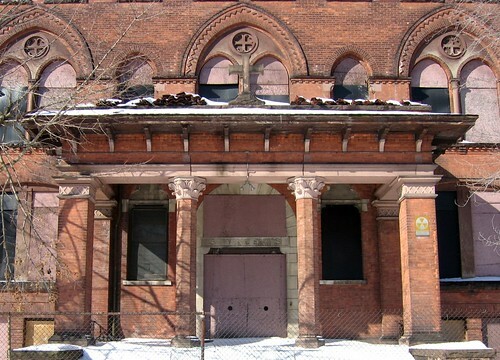 Here's the archive - Woodlawn Row Houses - to see Buffalo's best example of 'demolition by neglect' of a local-landmark. After 30 months of calling this to the City's attention, the place is still wide open. Suggestions? Let me know. Last spring I interned at George Mason University and wrote a number of reviews and longer papers for GMU's History News Network. While bopping back and forth gotta say I never had the opportunity to sit in on any of Richard Florida's lectures at GMU's School for Public Policy. My loss. Richard Florida's blog The Creativity Exchange has become a daily read. Book mark it now or subscribe to the feeds. Just finished listening to the 45 minute podcast from University of Chicago Nobel Prize winning economist Robert Lucas. Click into the post and you'll find links to Jacob's work, too. Excellent Jacobs links here, from an October 2005 post and comments.